ABC’s Good Morning America held what felt like a pep rally this morning to kick off “Breast Cancer Awareness Month”. The show’s tag line, “Go Pink!” – and it certainly did with anchors and guests in pink dresses, fans in pink t-shirts, a studio set lit up in pink lights and reporting on this disease through rosie-pink colored glasses. Considering how much time the network chose to devote to the topic there was little real news and not much to advance this important story which affects 1 out of every 8 women in the United States. Yes, GMA had the first interview with the doctor who treated Angelina Jolie but the topic of preventive mastectomies is one that has been covered frequently since Jolie’s announcement. This is a conversation that would have been worth exploring… but that wouldn’t have been any fun. And it was clear the goal today was to have fun. There was a “Steals and Deals” segment – discounted items on sale with proceeds going to breast cancer charities. It wasn’t made clear if all the proceeds were going to these charities or how the money would benefit women with the disease. I personally found this segment offensive. Of course it wouldn’t be a morning show without a gimmick. A “mammovan” was parked in Times Square where correspondent Amy Robach got her first mammogram live on air. 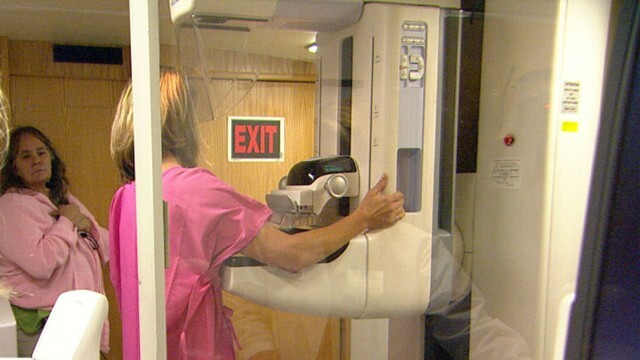 The main message of the program seemed to be if you just get a mammogram everything will be okay. The other ongoing theme of the program was all about survivors. The music bed under this morning’s segments included Gloria Gaynor’s, “I Will Survive” and Mandisa’s “Stronger”. Throughout the morning GMA aired live shots from around the country of survivor groups cheering – sometimes even with pom-poms. At one point Sam Champion spoke with a fan who is a ten year survivor and she said, “It’s perfectly possible to survive.” I truly hope that is the case for this woman but the reality is it’s also perfectly possible to die from this disease. That was never mentioned this morning. The American Cancer Society estimates more than 39,000 women will die from breast cancer this year. My takeaway from today – it’s not the media’s job to be a cheerleader. It’s not the media’s job to give women a false sense of security. It’s also not the media’s job to scare them. We need to give them the facts and we need to advance this story forward. This is a serious disease and we do women a disservice by wrapping up breast cancer reporting in a pretty pink ribbon and pom-poms.